Scartol: Well, this sequence takes us to the same situation we had in Snapback Problem 7. But I feel like that's too simple. At least it's a start..? Obviously in the above is not forced, but seems like a natural move that leads to disaster. 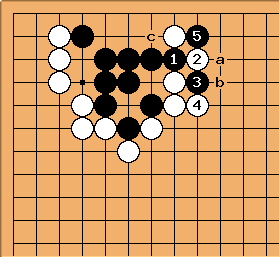 A white move at a is bad (see last problem Snapback Problem 7). 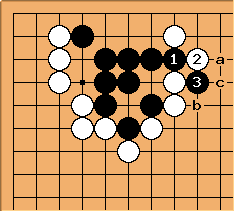 Depending upon the outside position, White b or c are called for. unkx80: in this diagram is very naive in immediately capturing the black stone. If connects at , the black group will die. 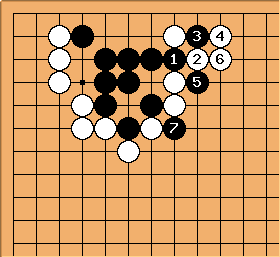 Giving Black the corner, at the cost of two stones??? Ummm... a little help please? As shown in Snapback Problem 7, for White to take with the marked stone seems bad in all variations. Also I think there is a misunderstanding about these types of problems. 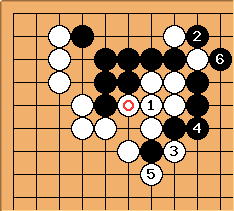 The right edge of the game diagram shown in the original problem is not the corner of the game board. That is what the above comment meant that White's fourth move depends upon the outside position. Charles See conventions in life and death for information about the normal assumptions in problems. White 4 at 'b', success? Clearly this position only favors White, if we assume something about White's relatively strong position (not shown in the original problem). Or else the two lone white stones near the edge will probably die a quick death. White 4 at 'c', success? This option for seems more risky, but relies less on assuming something about the surrounding white position. seems safe (but I have not worked out all the details about it). Depending upon how the ladder works, at z kills and . And Black seems to escape. If the marked white stone is to be saved, then at q is needed. But then at' 'r'' kills the two white stones. 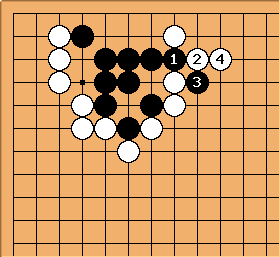 As shown in Snapback Problem 7, for White to capture at d was death then, and probably still is death. 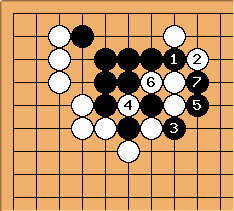 Thus the only way for White to prevent the black escape is as shown, and that depends on a strong outside position. 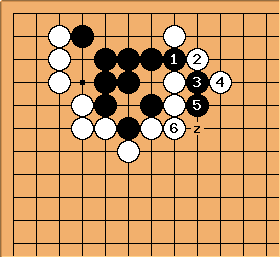 Also if Black plays at e, White connects with q and seems to avoid problems (her two stones lost in the above variations are now stronger with ). How about the top of the page? Jasonred Hopefully, there's no misunderstanding about the top of the page borders as well as the right and bottom... anyhow, Black wouldn't be in trouble if it wasn't on the edge... does this work then? This is how to take advantage of White playing at instead of a, sort of. Anyhow, White a or b are answered by c, which gives Black enough room for eye space, methinks. Charles Yes, the cut at here is what the One-Two-Three idea immediately suggested to me. That is, White ought not to play this way; so White defends, Black lives, and Black hasn't played an unnecessary stone at .